A large cockpit and minimal accommodations make the Hunter 22 appear decidedly different. But rearranging space according to French fashion can be a smart idea. What’s a perfect family boat? One that the elders can take out with their buddies for a Wednesday night beer-can race. One that accommodates the entire family without people stepping on each other’s toes. One that doesn’t sink the household budget. One that tags along on vacation. One that doesn’t stress out dad too badly when he goes for a singlehanded spin after work. One like the Hunter 22. 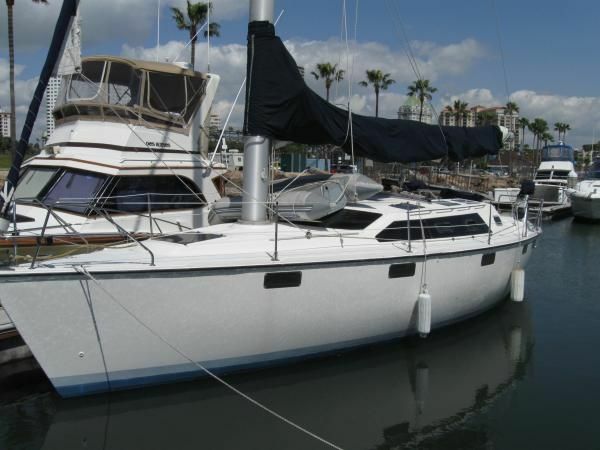 The Hunter 22 is a Glen Henderson designed daysailer with a big cockpit and a double-bunk forward. There’s incredible potential in this small cruiser, which represents an evolution and refinement of Hunter's preceding model, the 216. 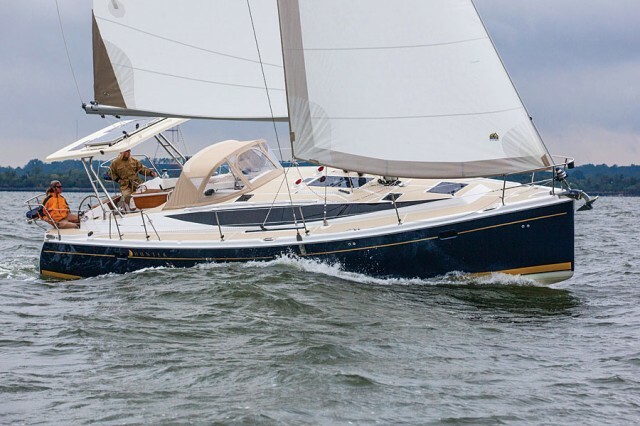 The new Glen Henderson design is built from classic hand-laid GRP, and the words 'simple,' 'unfussy,' and 'practical' describe both the Hunter yard and the Hunter 22. There’s not much on this boat that isn’t absolutely necessary: no gadgets, no gimmicks, and no trends are being chased except, perhaps, for the retractable bowsprit for a furling reaching sail. Too bad though, that those two features were missing from the test boat. 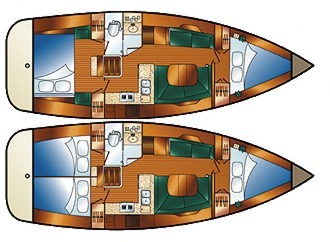 The deck layout is simple, with emphasis on open-air living in the cockpit. The boat we sailed last spring on the still uncrowded Lake Edersee (130 miles east of Cologne) was equipped with a good set of North Sails, consisting of a jib and a rather conservatively cut main. With a moderately experienced crew to handle the 30-square-meter gennaker, there’s no doubt we’d have gotten on a plane. At least until the next wind shift. 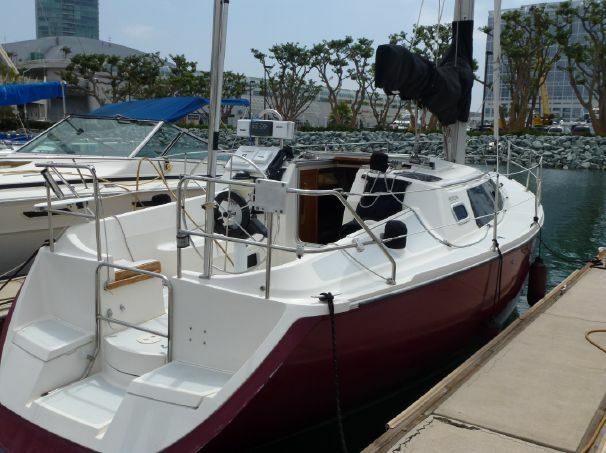 But even without the excitement of flying an A-sail, the numbers on the speedo were more than respectable: 5.5 knots upwind and 6.5 knots on a reach sit well with this family sedan, and are above average. A family vehicle it is, because who, if not parents with a flock of kids, would need a cockpit that’s nearly 3.5 meters long? To open it up some more, the manufacturer moved the rudder, which used to run in a cassette on the 216, all the way aft. Now the stern-hung foil eliminates hardware embellishments, thus freeing up 30 centimeters of valuable cockpit space. This further improves maneuverability of this boat, which impresses immediately with its tiller feel. The Hunter swiftly converts puffs into forward motion while remaining well under control and safe, even at significant heel. The faint of heart can reach for the handholds on the side deck while a more audacious crew would gladly use hiking straps, if there were any. However, retrofitting them would be a cinch. There are few embellishments on this boat. Jib leads on the cabintop, a stout mainsheet, the furling line for the jib, that’s all there is on deck. The vang is directly attached to the mast and the control lines are handled there as well. Nothing else is necessary. Now, if the sheeting angle of the jib cleat could be a bit deeper, there wouldn’t be any reason to gripe, because otherwise handling and dimensions are just about right. It's no surprise that a US-builder also uses US-hardware, Harken in this case, which is reason for sailors to rejoice. The only deficiency is the lack of jobs for a large crew. 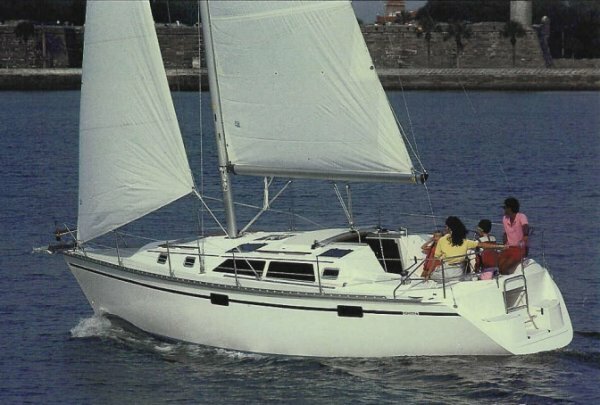 A sensible recommendation for a family vessel like this would be adding the gennaker package so idle hands would have a couple more strings to pull. And it’ll make Wednesday nights a tad more exciting, too. 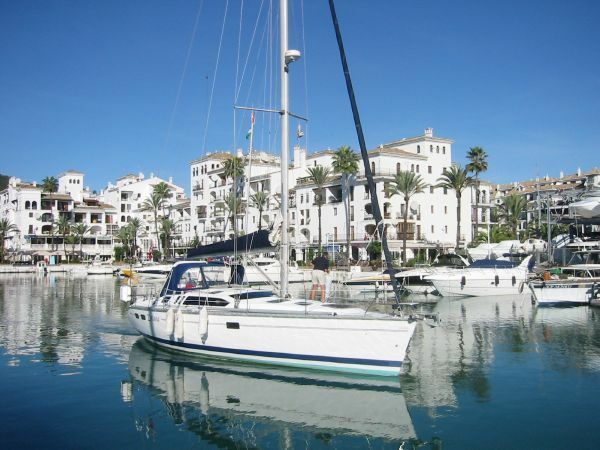 What about sailing vacations? Up until fairly recently, cruising and gunkholing on youth cutters was kind of hip, with kids sleeping in the cockpit or in a tent on shore. While this still might be appropriate for the offspring, mom and dad probably prefer the comfort of a real bunk. Hence there’s separation. The V-berth forward features a long side and a short side. 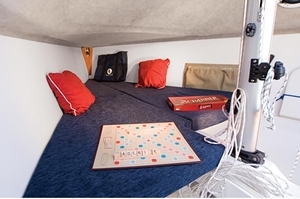 The space under the cockpit seats is reserved for stowing clothing in dry bags, and a tent near the boat’s center of gravity and out of the way. Hunter did not bother to sand and top-coat the area behind the canvas separator. Instead, any bags stowed in this hollow space will mute the noise of waves slapping the stern. Forward are the adult accommodations, with clearly defined spaces. The port side of the berth is longer, and is presumably reserved for the male, who is on average 13 centimeter taller, at least according to the statistic. On the lady’s side, a canvas bag on the inside of the hull is the only storage within reach. The carpet ceiling cover is not aesthetically appealing. A liner would be a nice touch here, but probably would also increase the price. 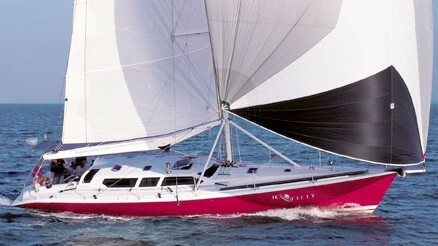 Close to 22,000 Euros have to be shelled out for the Hunter 22, but the dollar exchange rate causes some fluctuation. Therefore the boat isn’t exactly a steal, but a straightforward and down-to-earth offering with plenty of facets and solid build quality. Operating the 200-kilogram folding keel with a hydraulic cylinder that’s normally used for the backstay adjustment on larger boats, is a practical solution. 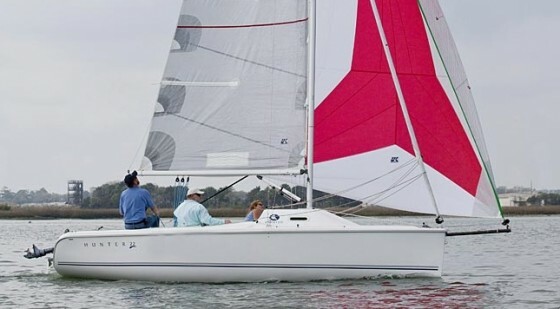 This kind of equipment, like the high-quality rig by US Spars, good canvas by North, and the Harken hardware, initially increases the price a bit, but pays off in the long run. And that’s the key point of this boat -- being part of the family for a long time. For more information, visit Hunter Marine.